Harold Biswell's decades of research and field experience were a major factor in developing policies of controlled or prescribed burning, which mimics or reintroduces the natural fire cycle. 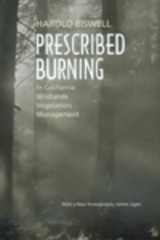 This comprehensive study introduces the principles and practices of prescribed burning, which apply far beyond California, within a historical and ecological perspective. Available for the first time in paperback, with a new foreword by James Agee, this book places Biswell's study—and his legacy—in the context of recent developments in the field. Harold Biswell, who died in 1992, was Professor Emeritus of Forestry and Resource Management at the University of California, Berkeley. He received many honors for his distinguished leadership in his field and authored nearly 170 scientific and popular articles. James Agee is Professor of Forest Ecology at the University of Washington.